themselves off of nicotine altogether and now use 0mg nicotine liquid. Most contain propylene glycol (a non-toxic, liquid base), nicotine, glycerin and food flavoring. current adult American smokers who will otherwise die of a tobacco-related illness over the next 20 years." 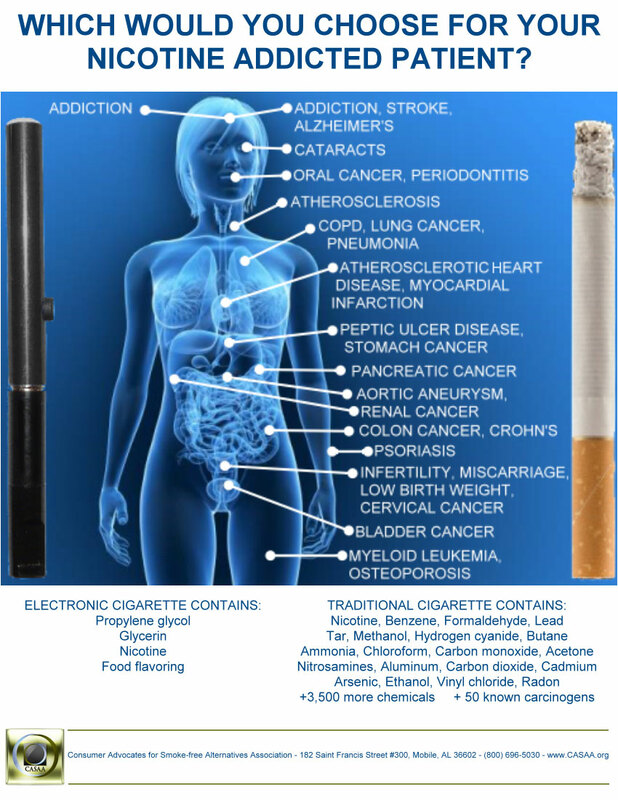 possible health risks, without the tobacco smoke, it is relatively low risk. Didn't the FDA say electronic cigarettes are dangerous and banned them? contaminated with "about 1% diethylene glycol," however subsequent tests have found no other contaminated cartridges to date. with the AAPHP that they are a reduced-harm tobacco product. The D.C. Federal Appeals Court subsequently upheld that ruling. marketed as reduced harm tobacco products. them altogether. CASAA is fighting these proposed bans. reasonable regulation; and to promote the benefits of reduced harm alternatives.